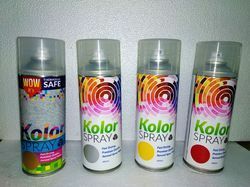 Prominent & Leading Wholesaler from Mumbai, we offer kolor spray. n aerosol based spray paint which is a must for touching up powder coated components, finishing requirements and improving old or rusted parts. This product can be used to touch up in-transit damaged articles, powder coating industry, electronic industry and for household use. Colors can be provided according to specifications, samples or requirement for color matching. Production and Assembly: During production and assembly problems may arise with the finish like nicks and scratches, hiding or repair of any such imperfections can be easily handled using Kolor Spray Quick Touch-Up on the assembly line. Shipping: Shipping can take a toll on product finish, use Kolor Spray Quick Touch-Up for an instant original look. Product finish can be restored after shipping as original, ensuring quality and customer satisfaction. Installation: To ensure zero defect surface finish touch up after installation can be carried out using Kolor Spray Quick Touch-Up leaving the product after installation as original. Why use Kolor Spray Quick Touch-Up? Requires no solvents, buckets, spray painting equipments, mixing tools or even rags. Can be used without ever leaving their work area. Provides an economical and professional looking finish that is fast drying. Does not require any professional handling, it is easy to use and safe to handle. Kolor Spray Touch-up cans are airtight so that the contents cannot spoil or spill. Kolor Spray Touch-up can is tamper proof. Kolor Spray Touch-up allow you to use the exact amount of product that you need and keeps contents protected for use later. Kolor Spray Touch-up is convenient, economical and efficient.